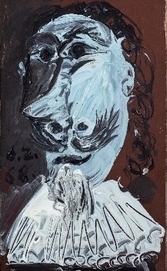 Pablo Picasso, ‘Le buste de mousquetaire’, 1968, the work purchased using an innovative crowdfunding technique. In December 2017, a Swiss crowdfunding website, Qoqa, offered visitors to the site the opportunity to purchase a Picasso painting, Le Buste du Mousquetaire (1968). For three months, a careful and efficient campaign was mounted, culminating in a victory, with sufficient funds raised to buy the Picasso. Le Buste du Mousquetaire now belongs to the Swiss people. Around 25,000 internet users came together to meet the asking price of 2 million Swiss Francs. The 40,000 shares, costing 50 CHF each, were sold within 48 hours, making this the first acquisition of an important work of art by an online community. The Museum of Modern and Contemporary Art in Geneva is the first institution to publically display the painting, which will be on show until October 2018. Each owner has been given a numbered card and a picture of the painting, allowing them to view the work for free. They will also be able to vote on the painting’s next destination in Switzerland. Qoqa has also provided a webcam and an interactive platform, “PiQasso”, available through the Qoqa website. A 3D scan has also been made, allowing visitors to immerse themselves in the work. The crowdfunding has been a spectacular success but it is not the first of its kind. In 2005, the Musée Lambert, near Avignon, France raised substantial funds through crowdfunding to maintain and restore its main collection. So is crowdfunding the next buzzword in the art market? It certainly provides an innovative and egalitarian way of preserving art in public collections. But a pesky legal question remains: who exactly owns this artwork, with up to 40,000 possible buyers…?